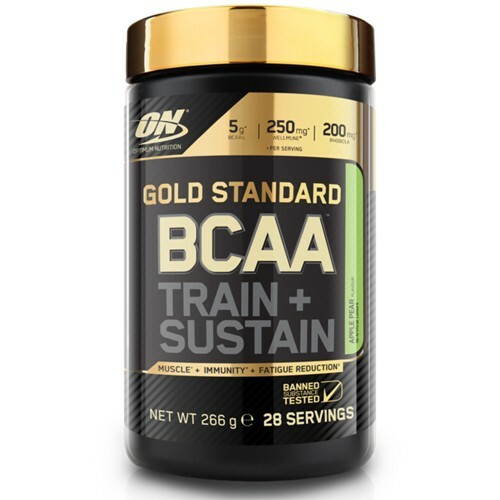 Produktinformationen "Optimum Nutrition Gold Standard BCAA 266g"
Optimum Nutrition, the most trusted brand in sports nutrition and maker of the world’s no.1 selling whey protein, has launched the new standard in intra-workout sports nutrition - Gold Standard BCAA Train Sustain. Now available in Apple Pear, Cola, Raspberry Pomegranate, and Strawberry Kiwi flavours. The new Gold Standard BCAA is a scientific blend of Vitamin C, magnesium, and 5g of branched chain amino acids designed for use before and during resistance and endurance. It is also the only intra-workout formula to contain new ingredients, Rhodiola rosea and Wellmune®. And because it also contains magnesium and Vitamin C, this new supplement can contribute to a reduction in tiredness and fatigue. It is the latest addition to the Gold Standard product range. This highly regarded range includes some of the most popular supplements on the market: Gold Standard 100% Whey, the world’s no.1 selling protein powder; the award-winning Gold Standard 100% Casein; and Gold Standard Pre-Workout. Now the Optimum Nutrition Gold Standard range can help to support your muscles 24/7 with an industry-leading formulation that lives up to its title. Amino acids form the building blocks of protein. Gold Standard BCAA Train Sustain contains the three branched chain amino acids: leucine, isoleucine and valine. These three essential amino acids are not manufactured by the body and so it is necessary to consume them through food or supplementation. It also contains magnesium, which plays an important role in protein synthesis. 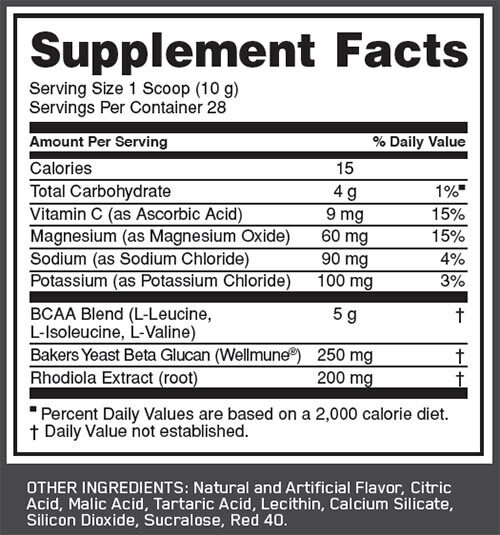 Gold Standard BCAA Train Sustain provides 5g of BCAAs per serving, including 2.6g of Leucine. After intense exercise, both in training and competition, the body's immune system can become temporarily suppressed. Gold Standard BCAA Train Sustain contains Vitamin C to support the normal functioning of the body's immune system. Magnesium is crucial to support the normal functioning of muscle and the nervous system, both of which can be taxed during extensive training. Magnesium also plays an important role in normal energy-yielding metabolism and can contribute to the reduction of tiredness and fatigue during and after training. Optimum Nutrition is dedicated to improving performance safely through innovative supplementation supported by rigorous scientific data. All products are manufactured to the highest quality assurance processes in an Informed Sport registered facility. 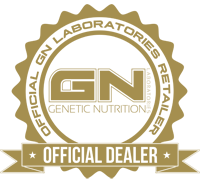 The Informed Choice logo indicates that these products are tested by the world class sports anti-doping lab LGC. It is just one of the reasons professional athletes at the top of their game choose Optimum Nutrition’s Gold Standard products. Whatever your goals Optimum Nutrition’s Gold Standard BCAA Train Sustain can support your performance. Weiterführende Links zu "Optimum Nutrition Gold Standard BCAA 266g"
Kundenbewertungen für "Optimum Nutrition Gold Standard BCAA 266g"